Worldwide an estimated 185 million people use a wheelchair daily. A company based in Auckland (New Zealand) has developed innovative robotic technology that helps people with mobility impairment get back on their feet: the robotic exoskeleton from Rex Bionics. The integrated maxon motors ensure smooth limb movement. Hayden Allen is a normal young man from New Zealand. He has been restricted to a wheelchair ever since a motorcycle accident that damaged his spinal cord. Back then, the doctors told him that he will never walk again. But that is not the case. Hayden is one of the first users of the Rex robotic exoskeleton. The first time he tested his robotic legs, his friends told him that he should stop looking at this feet. “I simply could not stop staring at my feet moving,” says Hayden as he describes his first steps with Rex (see video below). The robotic legs gave him back quality of life and new perspectives. Locations that were previously completely inaccessible were now within reach again. In his profession as a mechanic, he is now again able to perform tasks that require him to stand up, and many new opportunities are available to him in his leisure time. Around nine years ago, the two founders of Rex Bionics, Richard Little and Robert Irving, had the idea of developing this kind of robotic legs. The reasons were obvious: Robert Irving had already been diagnosed with multiple sclerosis and he knew he will end up in a wheelchair sooner or later. Both of the developers’ mothers are in wheelchairs, thus they knew very well what great obstacles are faced by wheelchair users. The two friends decided to use their know-how as engineers to develop a machine for people who would usually require a wheelchair to move about. This was the birth of the New Zealand-based company. An exoskeleton provides the human body with external support. Exoskeletons have been developed to help people with mobility impairment to walk. This improves their strength and endurance. Rex gives these people the ability to stand, walk, get up, turn around and sit down all by themselves again. Moving sideways, taking the stairs or walking on hard, flat surfaces with slopes also presents no problems. Even though the bionic legs cannot fully replace the wheelchair, the user is once again able to perform tasks standing up. Even just being able to be on the same eye level with conversation partners again is an unbelievable experience for these people. “We want to reach as many people as possible on the whole world, by using perfected technology and continuous improvements in functionality, form and usability. When we see the unbelievably emotional reactions of Rex users, every day brings us joy and that motivates the entire Rex team,” says co-founder Richard Little. Today Rex Bionics already has two manufacturing facilities where they produce two different Rex versions for different needs: „Rehab Rex“ is intended for use in rehabilitation centres. “Rex” has been developed for private users that can now perform tasks that are not possible when sitting in a wheelchair. According to Richard Little, the largest challenge during the development process was the development of the very complex robotic platform, which also had to be very light. Furthermore one of the basic requirements was that the user, with his restricted physical abilities, has to perfectly harmonise with the externally mounted robotic legs and can fully safely stand and walk. The exoskeleton weighs 38 kg, but the user does not carry any of this weight. It is operated by means of an integrated, exchangeable battery that lasts around two hours of continuous operation. Rex is controlled with a joystick and control pad – other exoskeletons frequently use sensors. A large advantage of the joystick operation is that no movement or nerve functions are required to use the exoskeleton. At approx. 3 m per minute, the Rex is not very fast, but the user can move forward very safely. He won’t loose his balance – because, regardless of whether it is switched on or off, the exoskeleton always remains stable. Thus the user can also stand in a crowded environment, like a sports event or a concert, without worrying about being pushed over. Rex also does not require the use of supporting aids such as crutches, which means that the user has full use of his arms and hands. Rex is a highly complex electromechanical device – each exoskeleton has thousands of precision parts, including the limbs that are controlled by a network of 29 microcontrollers. The special arrangement of microcontrollers in Rex makes it possible to move and react within seconds. The movements performed by Rex always feel smooth to the user. Motors made by maxon are responsible for ensuring that no jerky movements occur. They control all movements of the limbs, which move in the same way as a human leg. Ten DC RE 40 maxon motors are used in each exoskeleton. The RE 40 is equipped with powerful 150 W and has an efficiency of more than 90 percent. The mechanically commutated DC motors are characterised by a good torque behaviour, high dynamics, a very large speed range and a long service life. The heart of the motor is the globally patented ironless rotor that ensures detent-free running of the drive. Hayden Allen from New Zealand is one of the first Rex users. maxon motors per exoskeleton ensure smooth movements. The heart of the maxon DC motors is the globally patented ironless winding. Maxon motor is the proud sponsor of the 2012 NI Autonomous Robotics Competition. Good luck to all the entrants of the competition and we look forward to helping you with your automation needs. In applications where every millimetre counts and high torque is asked for, flat motors, in particular, are applied. 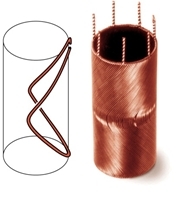 Hence, dense integration in overall length is essential for this type of motor. 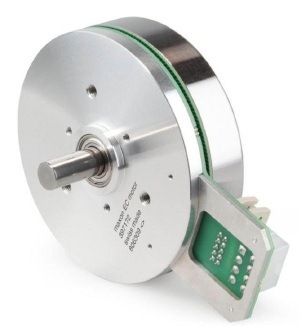 In order to take advantage of the EC 90 flat motor’s ultra slim design also in high-precision applications and positioning tasks, a microsystem is being applied; the MILE encoder. The incredibly miniature system can be integrated into the motor without adding length. Behind the abbreviation MILE hides Maxon’s Inductive Little Encoder, the worldwide smallest inductive rotary encoder. Its operating principle is based on the detection of high-frequency inductivity which generates eddy current in an electrically conducting target. High robustness towards dust or oil vapour, thus making additional protective measures, such as a cover, unnecessary. Compared to its predecessor, equipped with an optical encoder (see catalogue 2011/12, page 352), the new EC 90 flat MILE possesses a remarkably higher nominal torque of 517 mNm and is, with resolutions of up to 3200 impulses per turn, extremely precise too. It is distinguished by optimal integration of the MILE encoder and combines state-of-the-art with the tried and tested features; flange pattern, fixation, and pin assignment are all identical to its forerunner. Controllers: compatible with numerous types of servo controllers (ESCON 50/5, DEC, DECS, positioning Controllers EPOS2, EPOS2P EPOS3). High repeating accuracy due to resolutions up to 3200 impulses per turn. The new EC 90 flat MILE is particularly ideal for use in applications demanding high torque and positioning tasks, as well as for high-precision variable speed setups. -100°C to +200°C, vibrations, impacts: maxon drives are tough. Drives manufactured by maxon motor can be absolutely relied on even under the most difficult conditions – they have for example been in use on [Mars] for years. 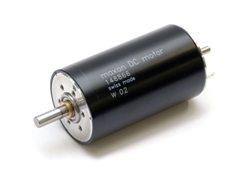 But maxon DC motors do not only do their job in space, they also function in tough conditions on and deep below the surface of the Earth – flawlessly and highly efficiently. At maxon motor, quality is not a matter of course, but instead the result of many years of experience and a continuous improvement process. Quality is tradition at maxon: The company received ISO 9001 certification in Switzerland as early as 1988. The [maxon medical] division, which provides high-precision drive solutions for medical technology, has ISO 13485 certification. This certification confirms that maxon medical adheres to the fundamental requirements of medical technology. All processes and procedures are documented; this guarantees traceability. Research and development at maxon motor. Market-oriented and customer-specific: At maxon motor, research and development (R&D) is the basis for future viability. The R&D activities of maxon motor are directed toward the requirements of the market and the customer. When the combination of standard products does not suffice, we develop custom designs. These can either be product modifications or new developments. Cooperation with institutes of higher education and universities around the world ensures that our drive systems meet the demands of new technology. maxon motor has R&D departments both at the headquarters in Sachseln (Switzerland) and at the subsidiary in Sexau (Germany). In addition to continuous product development, these departments are responsible for ongoing improvement of manufacturing processes and production and testing systems. Over 8 % of the revenue flows into R&D, where more than 200 of the 1,800 maxon employees work. Shakespeare in a new Light with flat, brushless Motors. The RSC Lightlock was developed by Vince Herbert, head of the Royal Shakespeare Company’s Lighting Department, to address a problem that has plagued lighting designers for years – the momentum of heavy, remote-controlled spotlights. Until now using flexible, lightweight support structures for these lights was out of the question, since attempting to stop would set the whole gantry swinging after each motorised movement, sending spotlights all over the stage and ruining the performance. The only way to use large moving lights was to hang them from heavy-duty mounting infrastructures – which made accessing the lights a lengthy, dangerous and costly process, severely restricting directors’ choices when deciding how to stage a production. The AIRCAP® distinctively differentiates from conventional angular wind deflectors. It is entirely embedded into the car body and completely concealed into the windshield frame when deactivated. In activated state, an aerodynamically shaped wind deflector extends on top of the windshield without disfiguring the automobile’s aesthetic side line. The AIRCAP® comprises two main components; an electrically operated wind deflector built into the windshield frame and a wind blocker located between the rear head cushions. Its activation increases the air’s free flow over the car interior which results in dramatically reduced air pressure and reverse air flow . It can be activated while driving (up to speeds of 160 km/h – or 100 mph) and can be used all the way up to the car’s top speed. The result is increased driving comfort and clearly reduced wind noise. And, as weather conditions and temperatures call for – or just to give free rein to a boundless convertible feeling – the AIRCAP® can again be deactivated at the push of a button. A drive system, designed by maxon motor GmbH in Sexau, Germany, takes care of moving the AIRCAP®. Its core piece is a motor/gear combination especially designed for the application based on a maxon A-max 22 DC motor and a customised gearbox with three separate reduction stages. Prominent characteristics are compact, robust design; high-capacity, silent, highly dynamic ganging, self-locking output in both end positions and handling-optimised, screwless assembly into the windshield frame. Behind the concept stand extraordinary high requirements related to comfort, miniature installation space and screwless assembly technique suitable for high volume production. Result is a drive system that claims just 22 mm of installation height and drives the three outputs for bracing, adjustment of the lamella module and latching of the AIRCAP® in a fix, coordinated and synchronized ratio.In retracted position, the lamella module is being braced and interlocked flush to the car body’s surface, in extended end position it is being mechanically interlocked. While being deployed, the drive overcomes wind ram pressures well beyond 250 km/h (155 mph) by torques of up to 7 Nm. As to acoustics and ganging, the drive fulfils the same high requirements, as Mercedes-Benz requires for interior passenger compartment instruments. Besides the high-end demands on power density, dependability and comfort, the drive also complies to the rigid constraints on optimised serial production. Thus, the entire drive assembly can be mounted into the windshield frame without the use of screws. Alike, the individual components, such as anti-vibration motor receptacle, motor, gear pinion, bipartite hull etc. are assembled with in an especially designed procedure. Staying in control has never been easier. All speed and position controls are specially designed for DC and EC motors with up to 700 W. With CANopen, setting up a network is easy. The range of 4-quadrant servo amplifiers meets all the power and speed precision requirements of maxon DC motors. With the maxon EC motors, you get cutting-edge electronic commutation. The available 1-quadrant and 4-quadrant amplifiers come with a variety of useful additional functions. When more than just speed and torque control is required and recurring positioning processes with complex trajectories have to be executed, position controllers are the answer. The EPOS2 (Easy Positioning System) is a modular product line for DC and EC motors. When that extra dose of torque is necessary. Our planetary, spur and special gearheads perfectly compliment our motors. When performance is required at high torque levels and correspondingly low speeds, maxon precision gearheads are in their element. In addition to a wide standard range of spur and planetary gearheads, maxon motor also excels in providing customized solutions, tailored to the customer’s requirements. Cutting-edge materials and manufacturing processes are used (e.g. CIM/MIM). The gearheads are adapted to the desired motors on site in the supplying plant, further improving the gearhead performance. Spur gearheads are suitable for low torques. The gearheads consist of one or more stages. One stage represents the pairing of two cogwheels. The first toothed gear (pinion) is mounted directly on the motor shaft. The bearing of the output shaft is usually made of sintered materials. Combined with maxon EC motors, ideal for medical technology. Spindle drives transfer the power generated by the motor into linear feed rate and feed force. The output shaft’s bearings can absorb highest axial loads. Enjoying life to the full – Taking carefree strolls through shopping centres, cycling with friends or perhaps going on a mountain hiking tour. With the right leg prosthesis being active can be part of day to day life again. Ottoblock and maxon motor give people new quality of life. Those who live with an amputation frequently have to overcome many hurdles on a daily basis – be it stairs or an uneven foot paths. With the right leg prosthesis, such hurdles are easy to overcome The C-Leg® is an intelligent leg prosthesis system that makes the life of transfemoral amputation patients much easier. With more than 40,000 supplied worldwide the advantages of this unique technology the C-Leg® prosthesis system are confirmed. Medical technology specialist Ottobock developed the leg prosthesis. Ottobock has shown stable growth for many years and as global leader in the field of prosthetics, it sets the benchmarks for the industry. The company builds on the mature C-Leg® technology, which has proven itself time and time again since 1997. And up to today, C-Leg® is constantly being developed further. For the current model, which has been introduced into the market in July 2011, many developments have been implemented. The prosthesis is now certified for a max. body weight of 136 kg. The intelligent knee joint permanently detects the current phase of the gait cycle and adjusts accordingly in realtime. The knee angle sensor supplies the information needed for dynamically controlling the swing phase, depending on the respective step length and frequency of the prosthesis wearer. The joint hydraulically limits the max. bending angle during the swing phase, i.e. when the leg prosthesis is in the air during the gait cycle. On the new C-Leg®, various mechanical and electronic adjustments allow improved swing phase control. As a result, the prosthesis user has a more natural gait and improved ease-of-movement in the knee joint. Whether the wearer is taking the stairs or manoeuvring through a packed shopping mall, taking a leisurely Sunday stroll or rushing to work – the C-Leg® system automatically adjusts to all situations. Uneven ground, darkness or a crowded environment is also no longer an insurmountable problem, as the high resistance secures the C-Leg® during the stance phase and the knee joint only switches to the swing phase when it is necessary. This significantly reduces the risk of falling when wearing a leg prosthesis. The C-Leg® also offers a special mode that allows it to be configured for various activities such as cross-country skiing or cycling. In this additional activity mode, the amount of hydraulic dampening depends on the knee angle. The initial dampening and the progression can be configured individually. Thus the behaviour of the leg prosthesis can be programmed for diverse activities beyond normal walking. To enable the prosthesis to withstand the stress to which it is subjected daily, the high-activity frame of the prosthesis is made of carbon, an extremely stable, high-quality and light material. The frame covers the electronics, the hydraulics and the battery. The characteristics of the hydraulics are adapted by means of two valves. These valves are adjusted by maxon RE10 DC motors. Two motors are used in each C-Leg®. Here one of the main strengths of the RE10 is its compact size. 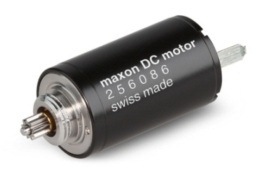 With a diameter of just 10 mm, the motor is the second-smallest DC motor in maxon motor’s portfolio. This, combined with the CLL system for a long service life, played an important part in Ottobock’s decision to use these high-precision motors. 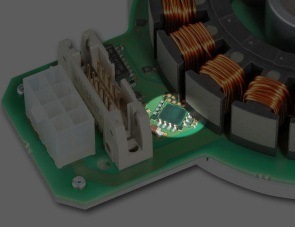 The motors furthermore have ironless windings and neodymium magnets that allow top performance at a minimum size. Precious-metal brushes are used for mechanical commutation of the motors. This ensures detent-free running of the maxon motors, even at low speeds. During commutation using brushes, contacts are constantly opened and closed via the inductive load of individual segments of the motor winding. The sparks generated when the contacts open attack the metal brushes and commutator of the motor, by melting the surface. This “brush fire” reduces the life span of the commutation system of the motor. By means of the capacitors integrated in the motors, the life span is significantly increased. The CLL principle (capacitor long life) means that an additional element is inserted between two adjacent commutator segments, i.e. parallel to the opening contact. Through the use of the CLL concept, the brush fire is largely suppressed. Furthermore the spark reduction also has a positive influence on the electromagnetic radiation. In the C-Leg®, the maxon motors have to operate in pulse mode or intermittent mode, i.e. the motor is only activated for a short period for adjustments and is not constantly in use. Ottobock estimates that 9 million such adjustments are made during the life span of the C-Leg®. On average, the motor performs 10 rotations for these adjustments. For many leg amputees, using the C-Leg® is a completely new experience. Contrary to other prostheses, the user of C-Leg ® do not have concentrate on every step. “It is not exhausting at all, it is impressively simple and I was really surprised. Now walking is fun again – almost like it used to be,” says Ed from America, who lost his leg in a car accident but has nevertheless been standing in a bakery for many years. The success story of the CLeg ® continues as more and more people are switching to this intelligent leg prosthesis and are achieving amazing things with it. In 2011, 74-year old Roland Zahn crossed Germany on foot, from Leipzig to Tübingen – with his C-Leg® as trustworthy companion. And a 60-year old woman climbed in the Himalayas at altitudes up to 4000 m with her prosthesis.